As I have mentioned before I have an eeePC 901 to write my notes on. One thing that is missing is ability to draw on it and seeing there currently aren't any netbook tablets which run Linux (preferably Ubuntu) yet here in New Zealand, I had to do the next best thing and brought myself a drawing tablet. 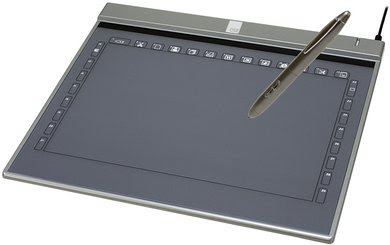 It is taking some getting use to as you are drawing on a tablet and it is appearing on the screen. I'm sure this will just take some time to get use to. It is fine for drawing things in OpenOffice.org Draw. With this means I can draw diagrams as I am going along. Drawing freehand on the computer is quite as can print it, email it etc. a bit like a printable whiteboards (the client site I am currently has printable whiteboards in every meeting and breakout room). This means I can have that one directory which has all my notes and diagrams and don't have to go thumbing through books to find it. It will take some getting us to until my drawing on the screen is as good as a whiteboard or paper but in the mean time it is really cool. I am using OpenOffice.org Draw because it comes standard in the Ubuntu 9.04 build though there are some Journal/Notebook apps out there that I could try e.g. Xournal, Jarna, Gournal and NoteLab. These all look interesting but having found the need to use them yet as gedit and Draw do what I need currently and also from having a quick look at them none of them have handwriting recognition. I have also installed CellWriter this provide handwriting recognition and after less than five minutes of training it was fairly accurately picking up charterers. Currently the only characters I am having a lot of issues with are t and +. The only other issue I had in getting CellWriter to work has I had to disable “extended input events”. It is fast and can write at a normalish speed on it. Though it does some odd behaviour when you reach the end of the input line and it sometimes moves the whole word onto the new line and sometime doesn't and also when you want a space at the end of the input line. I need to sit with a bit more and figure out what I am seeing and then a what I expect it to be doing. Thanks for sharing tablet writing and handwriting recognition article.